I posted a while ago that I joined a pretty cool site, Ravelry. It is for yarn crafters. I love looking at the things people make, but one thing that I have to realise is that I am too impatient for yarn crafts. I want results. Now. That being said, I do have 3 yarn projects on the go, a cardigan for Amy, a shrug for me and a scarf for Kate for school. 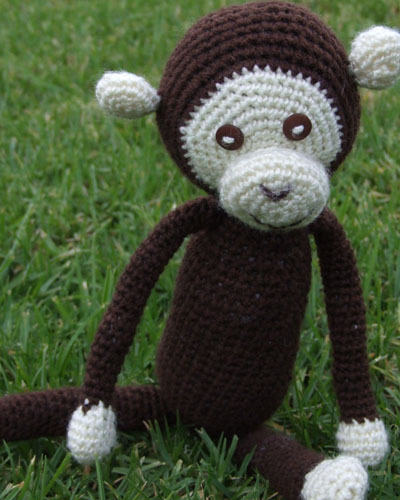 So I came across this really cool little monkey and since the pattern was free, I thought I would give it a go. A few things, no, he doesn't have a tail, I have made it but I want to put a pipe cleaner into it so it will be bendable (I had already sewn the arms and legs on when this was suggested to me.) and I would have used a smaller hook. I used a 4mm but since reading up on amigurumi you actually use a smaller hook, so I would use a 3mm hook next time. Although I cannot find my 3mm hook and Spotlight is out of them, what the? I know. I said that too. With the left over flannelette I am going to make some bibs as presents. I was planning on starting on those today. Yesterday I also bought some bright funky fabric to make a start on a quilted blanket for Amy. I am really excited and looking forward to starting this! I have a picture in my minds eye about what I want it to look like, but I guess with most creations, it usually never turns out how you envisaged it in the first place! Keep your eyes peeled for WIP pics! The kids and I made some playdoh aswell. They really enjoyed helping with the colouring. I found an easy peasy recipe at Kinder Planet. It also has links to other things to make. We are also going to make the clay and do a paper mache and I was thinking that the Melted Crayon Peels sounded like fun too. I was also thinking that I would like to make a Mel Goodsell cubby house these holidays also, but I am not sure if I will have the time. I love Mel's stuff, pure eye-candy! You are a clever duck. Love all these colours in this post - your selections are fab! Amy is so cute in her little sleeping bag too. I love the monkey you have created. Your so clever Beth. He is too cute. Congrats to Kate for loosing her 1st tooth. That's very exciting. She looks so grown up in her school tunic. Great to read Luke is going well with preschool and his speech lessons. He too is growing up and looking more cute in each photo. Thanks for your recent email Beth. It was great hearing from you. Have a wonderful day, keep warm and take care. 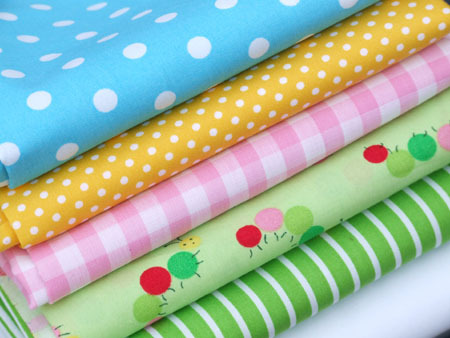 Oh Beth those fabrics are soooooo CUTE sweetie, totally love 'em and can't wait to see what you make with them. And that monkey... how sweet is that?!! ahhhh you made that monkey?? i LOVE it. i just wish i could do those kinds of crafts. you should get a japanese craft book, they make things with that kind of threads, like hello kitty and other kawaii type cutesy things. not sure your into them but im sure they would look awesome!! and i cant wait to see what u make with those fabrics, very pretty, as is that little bubba! what a cutiee!! You are a clever chook, aren't you!!! Amy is really starting to looking so grown up - and so like Kate and Luke! !